2. Fat is either lost or shifts down: Fat over the jawline appears in the form of jowls. 3. Bone structure shrinks compromising jawline further. Treatment: A facelift was traditionally done by surgery but currently many new techniques are being used to achieve a facelift effect without surgery. RF Viora Skin Tightening: Skin is tightened using USFDA approved radiofrequency technology. the a painless procedure with no downtime . More than one sittings are required. Fillers (Juvederm): Juvederm is US-FDA approved injection for wrinkles . 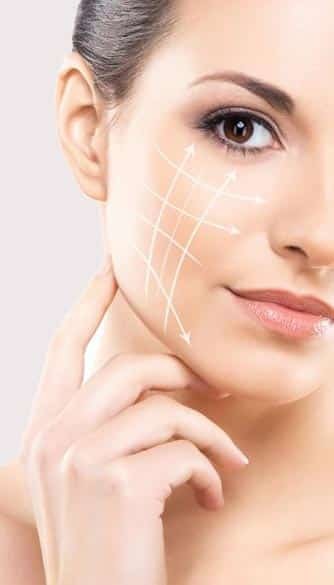 Liquid facelift and 7 point facelift are techniques of giving filler injections to get the effect of facelift. Botox: Botox is a wonder antiageing injection.Nefertiti lift is a technique of giving Botox injection to define jawline and give lifted appearance to face. Thread Lift: Absorbable threads can be placed in a minimally invasive clinic procedure into or beneath the skin to tighten the skin. Which Face-lift procedure is best for me? Doctor will first assess your problem, medical history and the severity of your problem. After an individual assessment, she will prescribe you the treatment that suits you best. Usually, surgical option is reserved for people in their forties and above. All the options will be provided to you, and you can choose the option based on your personal preference as well. How long does the result of a Face-lift treatments last? Six monthly touch ups are required for most of the nonsurgical treatments. The result of surgery last longer 5-6 years. If I do surgery, would I still need Botox /fillers (Juvederm)? Yes, you may benefit with Botox and Juvederm injections to maintain and improve your surgical results. At what age can I go for a Face-lift Surgery? Ageing is variable and varies from person to person. Race, genetics, general health and history of weight loss play the important role. Europeans and North Americans need facelift earlier than Indians or Africans. People who have had fluctuations in weight tend to have more facial sagging. Facelift is done for people 40 years and older. People in the limelight tend to get it done earlier so that the change is subtle and natural, not drastic. Are there going to be visible scars after a Face-lift surgery? Fat injections, BOTOX® Cosmetic injections, injectable fillers, facial liposuction, implants, and thread lift are the alternatives to the facelift. The overall result is not as drastic as the facelift. Single or combination of these procedures may be needed depending on individual’s requirement. These procedures are scarless and can be done in individuals who are not fit for major anaesthesia. How is surgical face-lift different from laser face-lift? These are 2 different things. Surgery removes the skin, fat and tightens the muscles. Laser resurfacing by the CO2 laser can remove superficial wrinkles but can not do the other things. Milder laser rejuvenation procedures like IPL give even less result than CO2 laser, after multiple sittings. Younger people with early fine wrinkles of the face without real sagging can opt for the laser. What is Thread lift and how does it compare to a surgical Face-lift? Special barbed threads are available (imported) that can be inserted under the skin through long, needles under local anaesthesia. Multiple threads are required. The threads can pull the skin in the desired direction. Advantages of threads are- no scars and no major surgery. Disadvantages are that result does not last very long and many threads are needed which can be expensive. I have heard of some beauty parlors offering face-lift. What is that? With some machine, muscles are stimulated, and facial massage is done. Understandably that is not a face-lift.